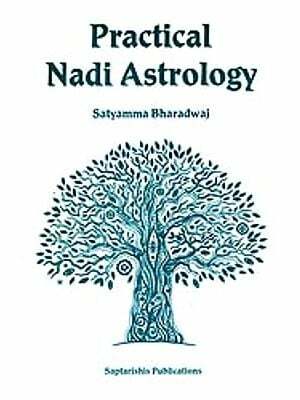 The benign blessings of Sri Gayatri, Sri Ganesa and the Grahas have kept me in a continued position to serve the astrological fraternity as a result of which only we are now again, in a quick succession, amidst the readers with the present work DOCTRINES OF SUKA NADI - Retold. 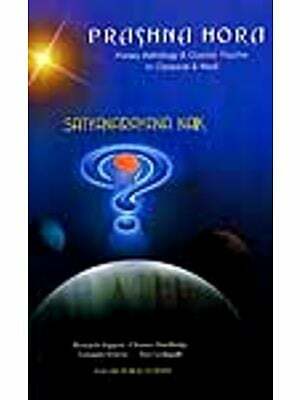 Unfathomable is the ocean of literature in Tamil on astrology as is in Sanskrit and is rich with a multitude of literary gems. 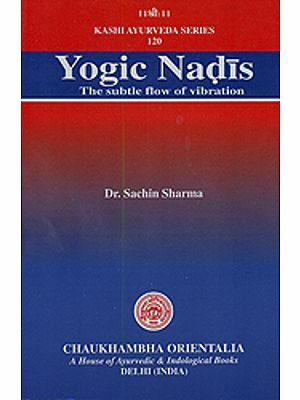 By oral transmission, right from the time of the sages, the contents were faithfully and unerringly handed down to the students by the masters. The students were equally discerning as their masters were and the result was a safe and unmutilated maintenance of 'records'. Time has from time immemorable been open to changes; came then the system of recording on walls, copper plates and stones. As a later development, writing with sharp steel pens on palm leaves came into existence. This was in vogue for centuries and records were preserved perennially on this media. 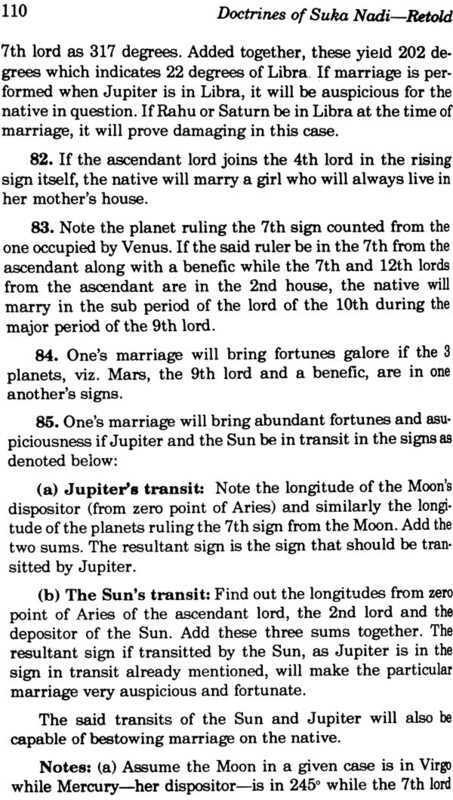 With all the broadmindedness of the past masters, several astrological treatises got lost due to lack of full-fledged and effective communication. In effect, many treatises are today known only by name and not by availability. 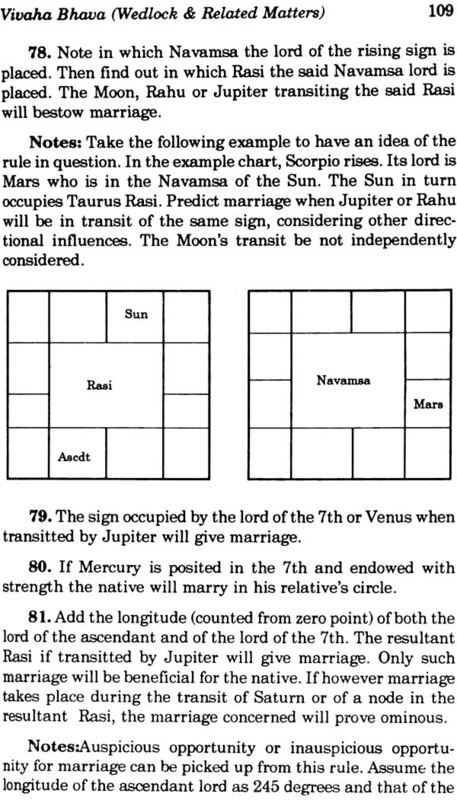 Learning astrology in India was those days mainly through some important languages like Sanskrit, Tamil, Malayalam, Oriya and the like. There are many manuscripts on palm leaves in Tamil languages the value of which is not known even to the owner to whom it is a family inheritance. This is equally true with some other languages as well. Tamil has been for centuries a major media of communication. 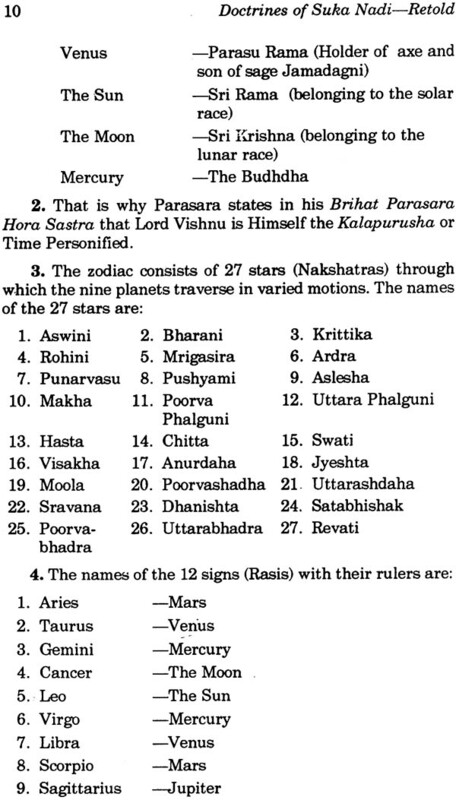 People with less proficiency in Sanskrit, depended on Tamil for learning astrology etc. There are said to be many palm leaves in Tamil dealing with a numerous Nadi texts, particularly in Chidambaram of Tamil Nadu. 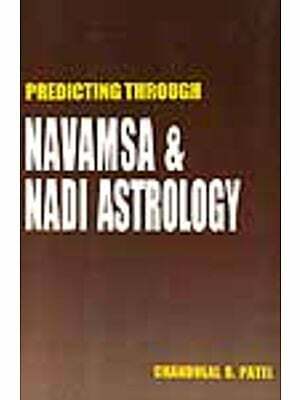 Nadi texts need not always be misunderstood to contain popular type of readings dealing with a chain of events in a particular nativity. 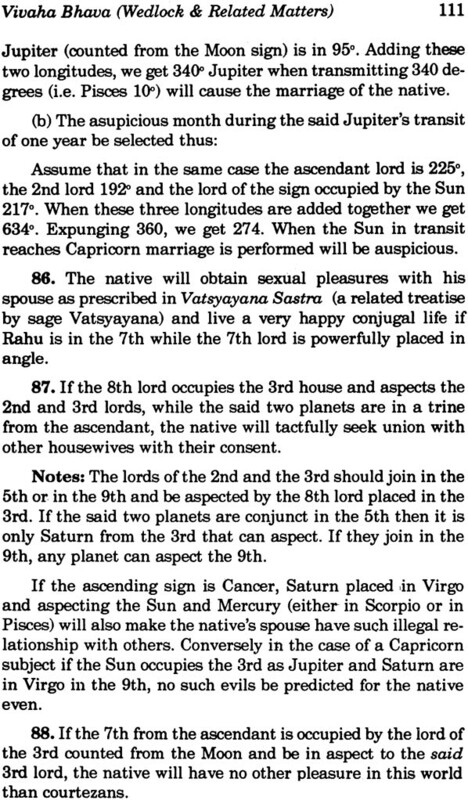 Some traditional authors, after a devout study of Nadi texts with readings, linking every possible event with an astrological reasoning, produced their magnum opus. 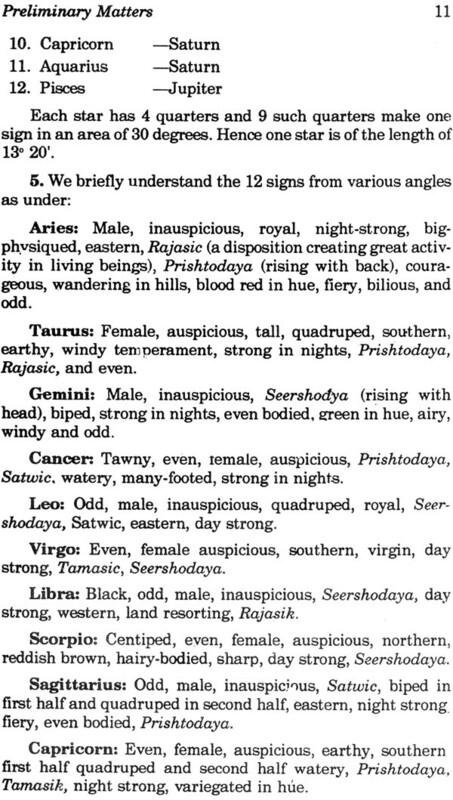 Most original Nadis were attributed to sources like Lord Siva, the Seven Seers (or Sapta Rishis), saga Kapila and so on and so forth. In my quest to present something novel, keeping at the same time 'antiquity' in mind, after presenting the English renderings of some popular classicals, I am herewith presenting the present English version of Suka Nadi. 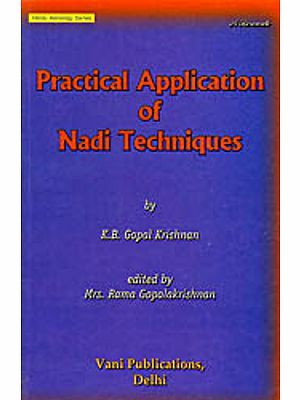 Suka Nadi (a Nadi by sage Suka, known as Sukar in Tamil identifying with reverence), is said to have had its format inauguration (or 'Arangetram' as known in the Tamil language) before the Sapta Rishis. The Original is said to contain 18,000 verses (@ 1500 verses per ascendant), as stated by the Tamil version with poems by late Ramaswamy Pillai and rendered in prose order by his disciple Aryamuthu Pillai. The Tamil version has additional information from immortal classicals like Pannerayiram, ackowledgements and gratitude are due to the said poet and the translator as well. Our present version based on the said Tamil text is entirely rearranged and some interpretations are retold by me in a more independent and appropriate manner, at the same time following the footsteps of the Tamil version. 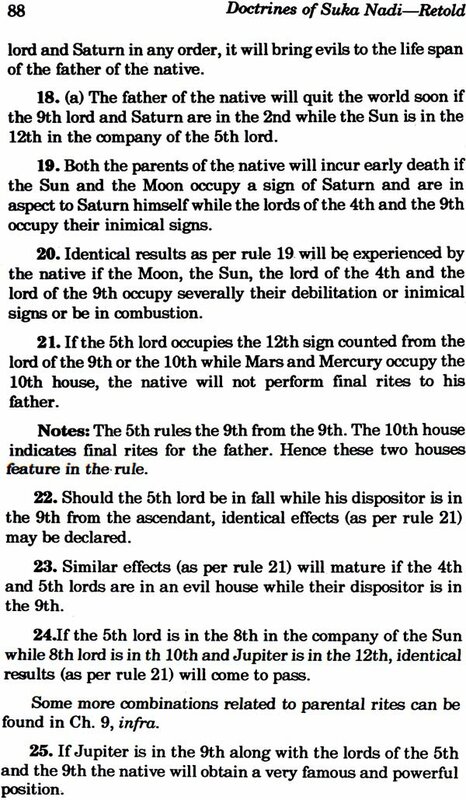 Various rules have been brought under different chapters as the original has had no systematic cauterization. However, I have not tampered with the original concept of the sage and other contributors. I have rather relied on the poems than on the prose order. On a close perusal, the reader will not fail to be convinced that there is every caution shown by me. 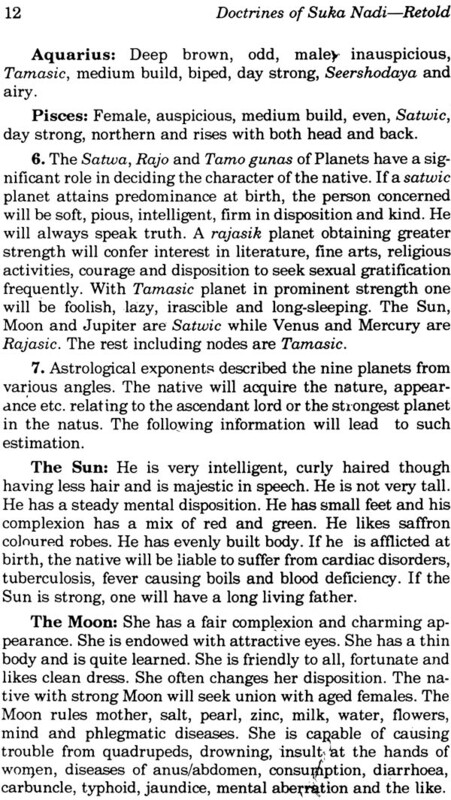 I have introduced chapter 1 of my own so the new entrants in the field of astrology have some basic learning. The said chapter is not exhaustive, however, for the obvious reason of maintaining brevity. 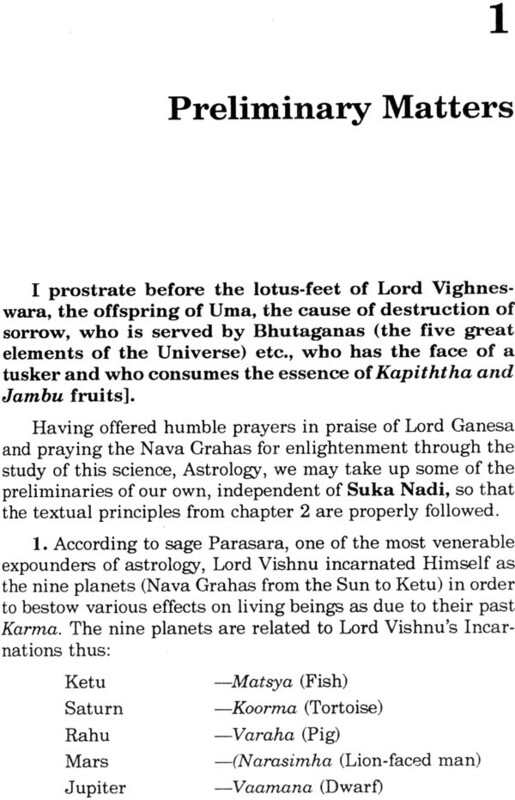 The aphorisms related to 'Suka Nadi' could be found from chapter II till the end. I must mention that I have not entirely taken advantage of the poems and proses. For example, the ones on Kalachakra Dasa. In the said Tamil version, this Dasa though dealt with this at length in my English translation of Brihat Parasara Hora Sastra, I did not think it essential to enlarge the present volume. Another chapter eliminated by me is on marital match. 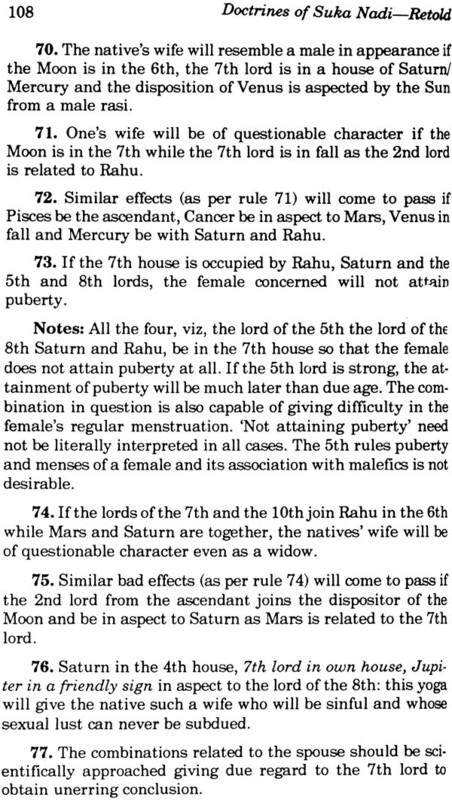 Somehow I could not appreciate the particular portion, nor could I find it to be beyond the 'Dasa Vidha Porutthamgal' or the ten fold compatibility like the one by birth asterism, Yoni, Mahendram etc. These accost one in every elementary text and Panchamgas. There is more to it than meets the eye. 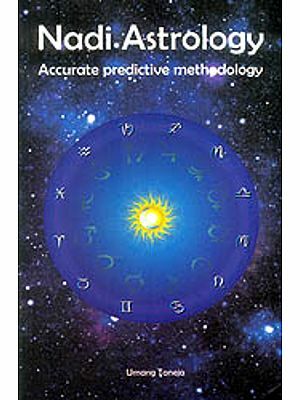 I can say one thing without fear of contradiction - many aphorisms are exclusive to the present work and covey a unique approach and force of genethliacal astrology. 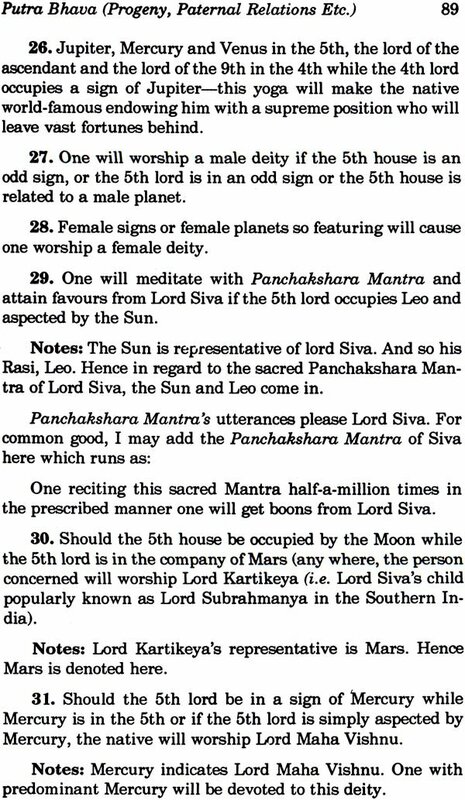 Right form Parasara Hora down to Jataka Tatwa, none contains most of these rules. This statement is not to undermine the importance of those works but to throw light on how useful an addition is the present attempt. In a long journey, there are many phases and halts; likewise the present one is a different phase on the same route. But in a complex subject like astrology, we can perhaps never terminate our journey of learning. An incision can never consume the whole tree, nor could a human being digest the whole of astrology. So to say, any additional literature is bound to be welcomed by the wise reader. Though my curriculum studies were in Telugu and English, an unknown desire made me learn some more languages. When I was in the left side of my twenties, I took, though not with a specific mission, to the study of Tamil and Sanskrit and later on Hindi. Thanks to my own good stars, these languages have proved a great asset for me now at this stage when I have embraced astrology as a discipline of everyday life. I realize that my work may be, rather is, defective for reasons of my limitations, what in the relevant languages and what in astrology, as a human being. To err is not just human but to err is a prerequisite and prequalification to be a human being and not to go beyond that. Hence I shall feel grateful and rewarded if the learned public could find at least an iota of usefulness in my humble mission of writing these works. 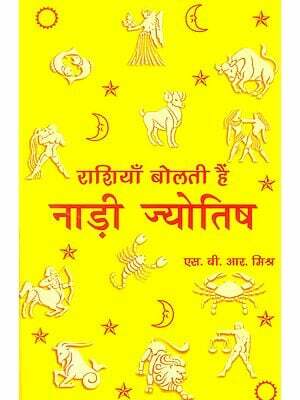 The enthusiasm shown by M/s Ranjan Publications in making this work available to the discerning readers need to be appreciated by all lovers of astrology. The Printers, M/s. Janty Printing Works deserve a special mention for their fast and at the same time, neat execution.